For over a century, as women have fought for and won greater freedoms, concern over an epidemic of female criminality, especially among young women, has followed. Fear of this crime wave—despite a persistent lack of evidence of its existence—has played a decisive role in the development of the youth justice systems in the United States and Canada. Justice for Girls? is a comprehensive comparative study of the way these countries have responded to the hysteria over “girl crime” and how it has affected the treatment of both girls and boys. Tackling a century of historical evidence and crime statistics, Jane B. Sprott and Anthony N. Doob carefully trace the evolution of approaches to the treatment of young offenders. Seeking to keep youths out of adult courts, both countries have built their systems around rehabilitation. 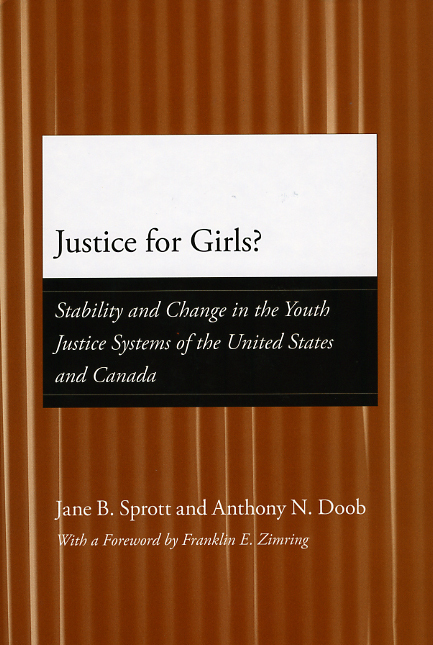 But, as Sprott and Doob reveal, the myth of the “girl crime wave” led to a punitive system where young people are dragged into court for minor offenses and girls are punished far more severely than boys. Thorough, timely, and persuasive, Justice for Girls? will be vital to anyone working with troubled youths. Jane B. Sprott is associate professor of criminal justice and criminology at Ryerson University. Anthony N. Doob is professor at the Centre of Criminology at the University of Toronto and coauthor of Responding to Youth Crime in Canada. 2. Are Sugar and Spice Really Evolving into Snips and Snails and Puppy-Dog Tails? Book published by University of Chicago Press, 2009. Page maintained by BiblioVault.